An Israeli saying says ‘The human heart and the seabed are unfathomable’ – This is kind of true but as scientists we are at least trying to discover the ocean and reveal its secrets. To reach that we invest not only a lot of sweat and power but rather a lot of heart! We are this year’s Team Israel that actually consists of two German students. 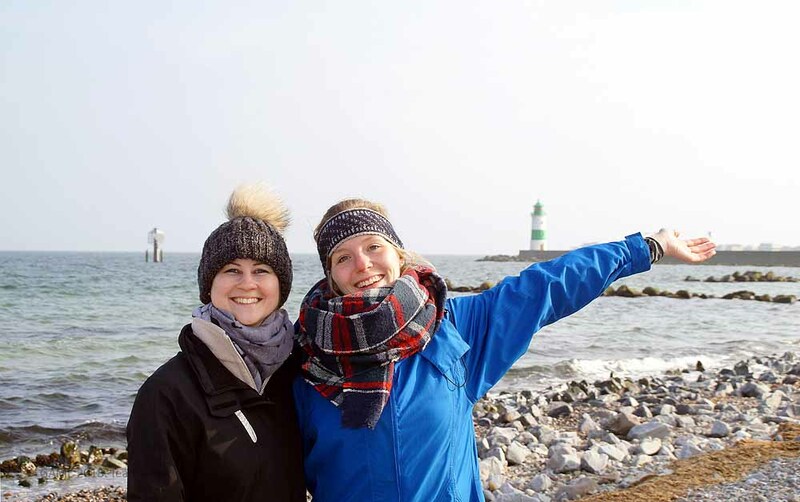 Laura Argens, who studies ‘Ecology and Evolution’ at the Goethe-University Frankfurt am Main, and Lisa Gassen from the University of Rostock who studies ‘Marine Biology’. Although our Master studies have different foci, we are now working on the same topic in a country which was completely unfamiliar to both of us on beforehand. 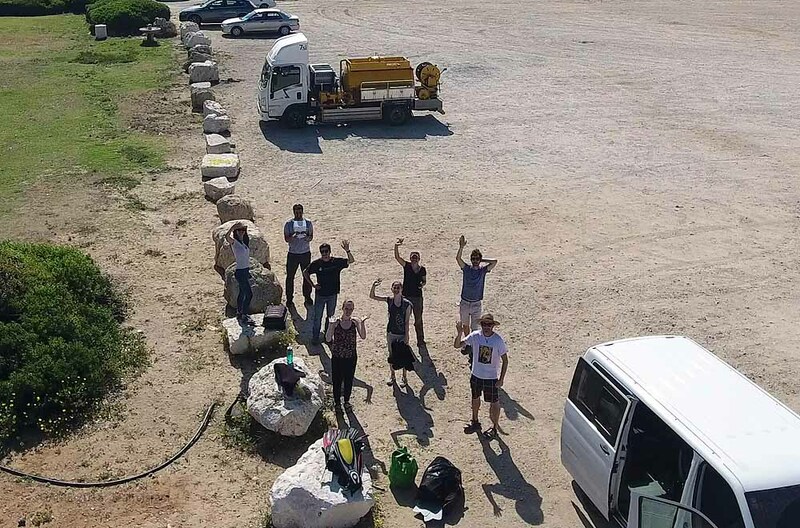 Team Israel in Schleimünde, where we got to know each other at the cold, Baltic Sea and now we are at the Shikomona Reserve in front of the Institute within the Israeli heat. … in Haifa, Israel and would like to tell you our GAME-adventure-story and what we experienced so far. The work in the Institute of Oceanography and Limnology is exciting. Although the building is a bit old and the floor plan is slightly confusing, it is perfectly located next to the Mediterranean coastline and close to the Shikmona Nature Reserve which makes the sampling of marine organisms easy. 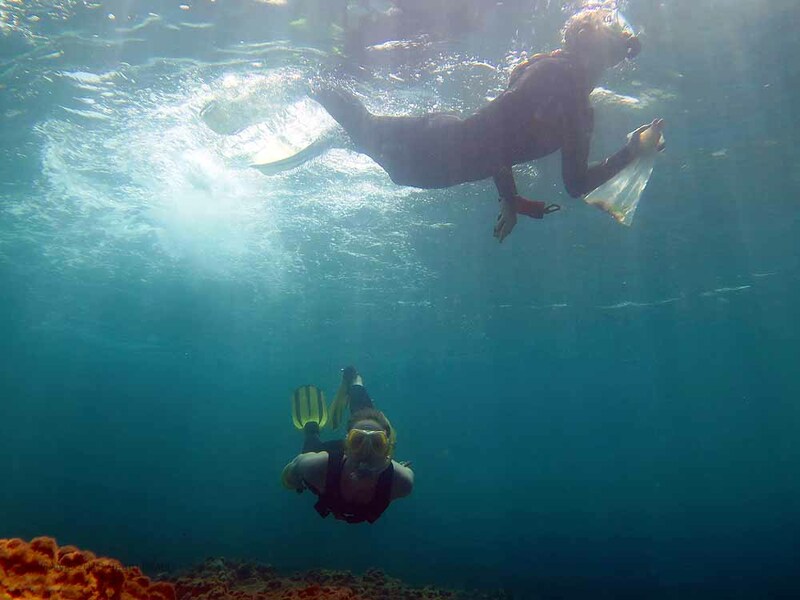 To collect the organisms for our study, we just need to leave the building and get ready for some snorkelling! It happened several times that we had to snorkel for 2 or 3 hours until we got everything what we wanted, but our snorkelling skills improve very fast, so we got faster with every time we´ve been in the water. Israel is located in the Eastern Mediterranean Sea and this is one of the regions which are most heavily affected by climate change. Because it is an enclosed system, the influence of global warming is stronger here than in other parts of the world’s oceans. Additionally, many invasive species came from the red sea through the Suez Canal during the last decades. We have to snorkel to collect our snails and algae. It´s always fun! 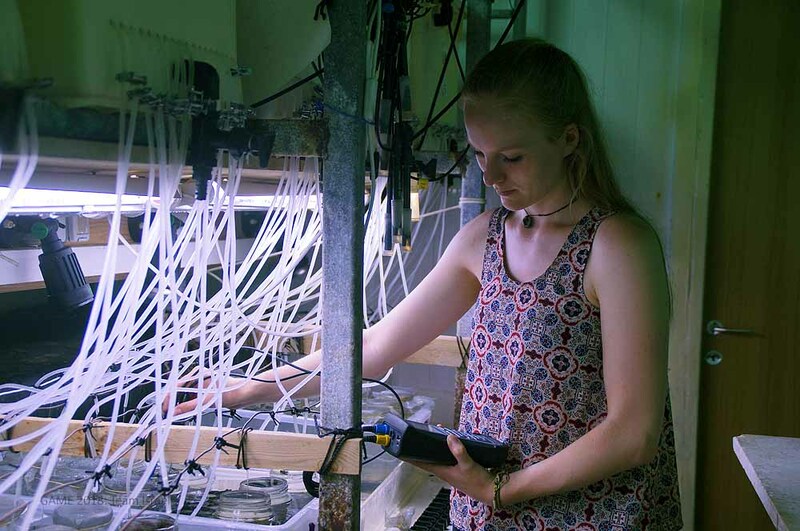 Like the other teams of this GAME project, we are studying the effects of increasing water temperatures on marine herbivore invertebrates and like the last year’s participant Luisa Düsedau we are working with the snail Conomurex persicus. This is not just a cute, but also an invasive, abundant and easy to handle species. Last year, the GAME teams measured consumption rates at different temperatures and this year’s topic is based on their results. It tests whether the food preference of invertebrate grazers changes when it gets warmer. This is our test organism: Conomurex persicus. In our main study, we are going to run multiple-choice feeding assays which we are going to start soon. 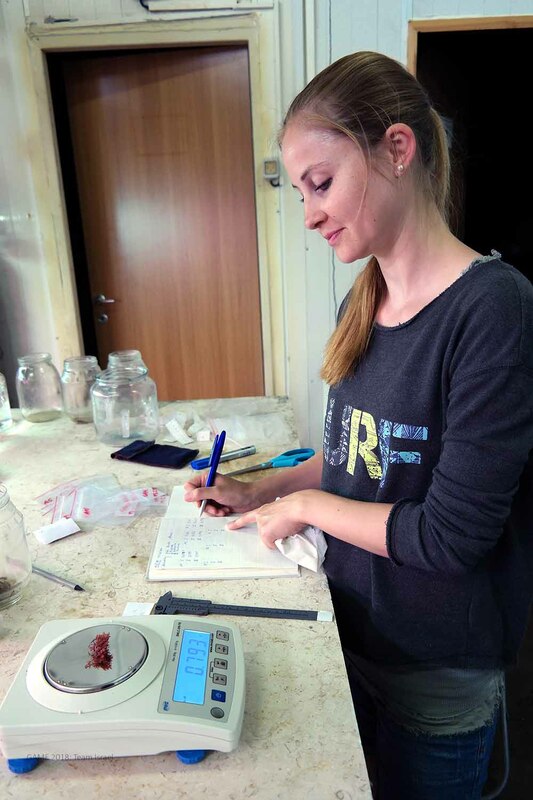 We will offer each individual snail food pellets made from 3 to 5 different locally abundant macroalgae species, let them graze for 48h and will then measure the amounts consumed per algal species. By re-running this experiment at different water temperatures, we will check whether the food preference of Conomurex persicus is changing with temperature. 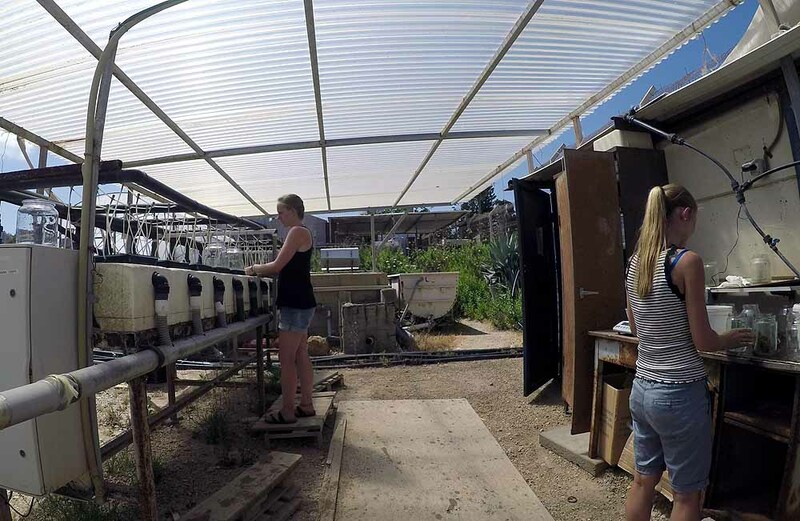 What is so particular about our experiment is that we are going to feed acclimated as well as non-acclimated snails with acclimated algae, but also with non-acclimated algae. The first scenario, where snails and algae are acclimated, will provide us information about whether the preference will change in a warmer ocean. 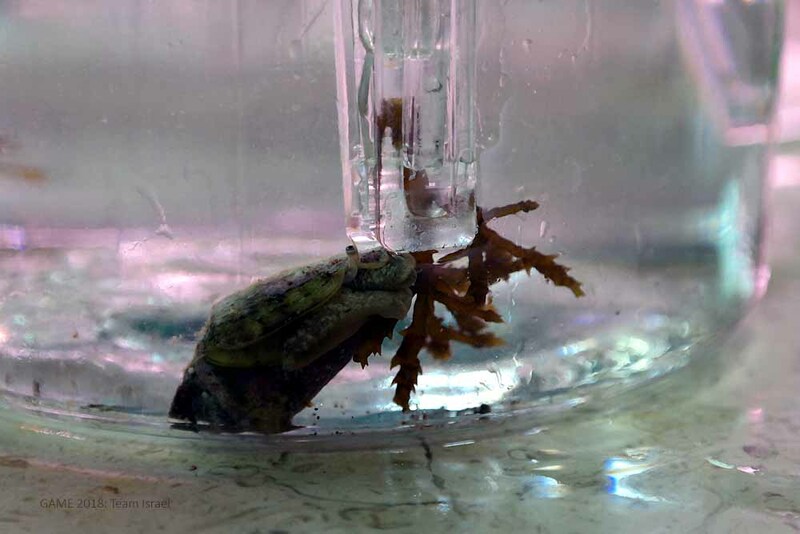 The additional scenarios, where non-acclimated snails are fed with acclimated algae and the other way around, will give us information about which component is changing. Higher water temperatures can, for instance, lead to a change in the nutritional value of the algae or it can lead to changes in the energetic needs of the grazer. But what kind of practical work does an experiment like this require? First, algae and snails need to be collected under water, what is only possible when the sea is smooth and when there´s a good visibility. Then they need to be acclimated to the lab conditions and finally to their target temperature. During this time, we need to make sure that the water quality is good, that all individuals have the same water supply, that the snails are fed and that they do not run out of food. However, it means also a lot of planning: You need to plan precisely when to adjust the temperatures, when to start which feeding assay and what to prepare for it. Soon we noticed that plans are there to be changed! Developing a plan and try to stick to it sounds easier than it is. When running test feeding assays, we almost immediately faced our first problem: For several reasons it did not work for us to offer thallus fragments from the different algal species to the snails – what was the original plan. So, we decided to offer them algal pellets, which are a mixture of algae powder and agar-agar (a biological thickening agent). For this reason, when we want to start a feeding assay, the first thing we need to do is making powder from dried algae. To produce food pellets from the powder and from agar takes some time, because we need to cast them in a mould, wait until they are solid and finally make sure that all of them have the same weight. The next step is to make sure that we feed an individual snail with algae which were acclimated in the right way – what can get confusing when you have acclimated and non-acclimated algae and snails. When finishing a feeding assay, we need to weigh the snails and all the algae pellets and then we dry the pellets in the oven to get their dry weight. But as soon as you solved one problem, there will be another one soon! Just two weeks ago, the huge amounts of algae that we collected during a 3-hour snorkelling session died after one day. So, we had to collect new algae and we are hoping every day that they are still alive when we do our daily water exchange! These were just a few of the problems we had and they could be solved easily! However, we also faced wrong deliveries of materials that we urgently needed as well as floods in the room where we are working on the weekends – when no one was there to fix the leakage. Even if we sometimes felt like nothing is working out fine, it is worthwhile making these experiences! Self-responsibility, working independently and reliability on each other are just a few of the aspects you gain when joining the GAME program! Working with the microcosms is always exhausting because of the heat. But it is a smart system, which regulates the temperatures in the boxes automatically. Here we keep and acclimate our algae at different temperatures. So, as you might suspect, we are working many hours including the weekends in the lab. 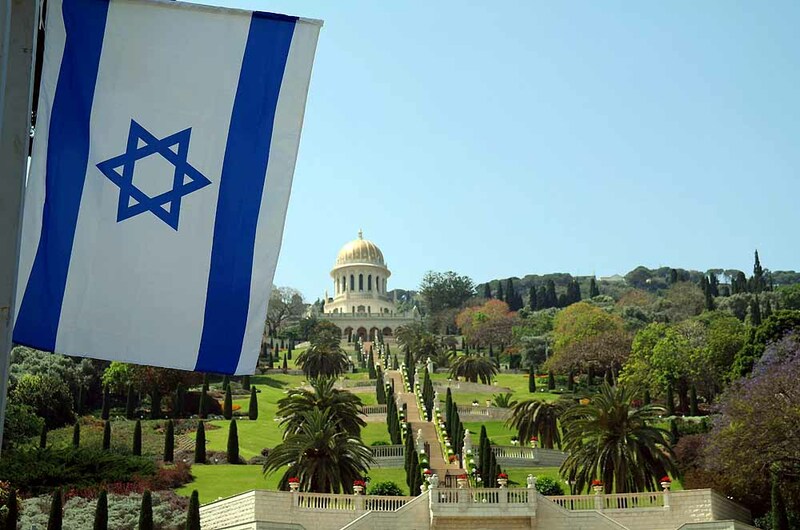 But besides that, we also have some free time to discover Israel. And what should we say… it’s beautiful! The holy land not just offers a lot of culture and history, but a huge variety of tasty food. You´ll find humus and falafel, which are also well known in Germany, as well as shawarma (which is similar to Döner), sabih (an amazing sandwich filled with fried eggplant) and of course lots of tahini (sauce with sesame paste as main ingredient), which is offered to every dish. But also, sweet stuff like baclava (pastry soaked with honey or syrup), kanafeh (sweet cheese with a sweet, pasta-like topic) and cinnamon rolls are awesome. 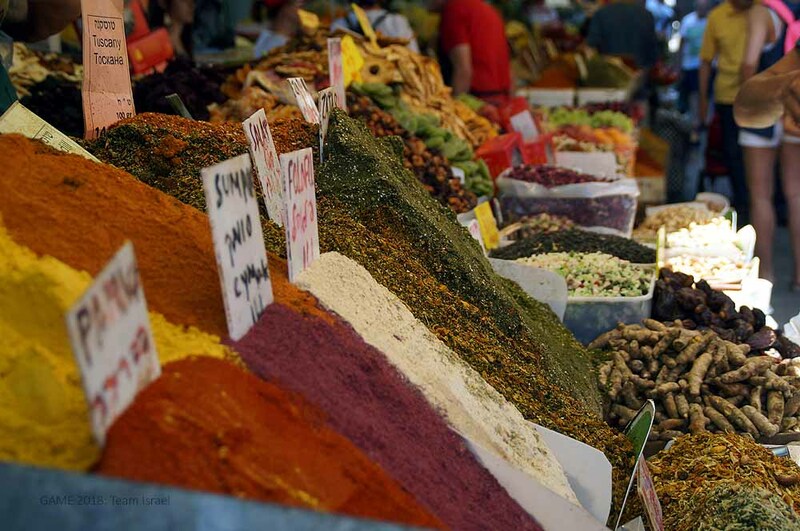 Our favourite hobby here is eating and going to the Talpiot market which offers fresh vegetables, fruits and nuts. There you meet a lot of locals, and it is a good opportunity to learn some Hebrew because not all the sellers speak English. Our second favourite experience so far was something we did in the first month, when we were on a lab excursion and went for shark snorkelling. We drove to Hadera, where a plume of warm water is released by the Rabin power plant and where, at this time of the year, dusky sharks are abundant. We went snorkelling the whole morning and saw at least two sharks and one loggerhead sea turtle. 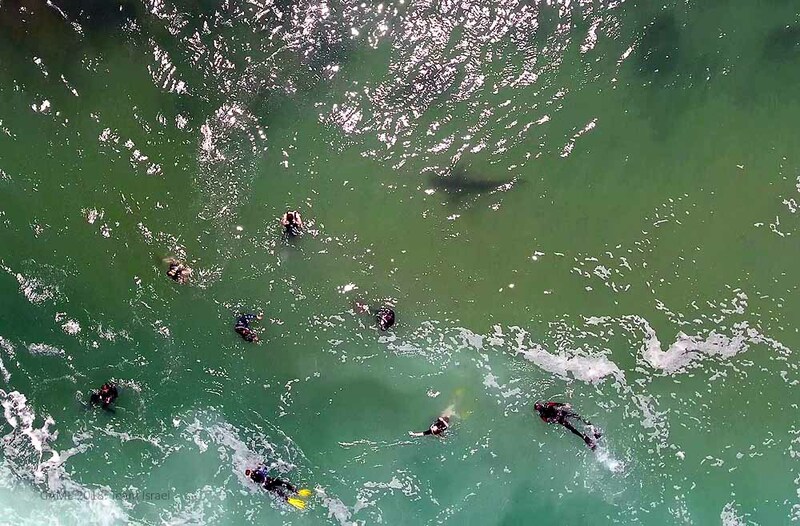 The visibility was bad, so we could see the sharks not before they swam directly next to us, what was a bit scary. But they are impressive, beautiful and peaceful creatures which were not harmful for us. A drone of the lab took this picture. You can see us snorkeling while one shark swam next to us. Our third favourite thing to do here, is meeting our friends (which are mainly from the Institute or the neighbourhood where all of us are staying) having a barbecue together or going to the local Bar `Bar Galim´ where you always meet people who are also living in the beautiful neighbourhood of Bat Galim. It did not take long to feel like being at home in this surrounding! The evenings are just one aspect that makes the Israeli life different from life in Germany! Because of the heat during the day, most activities normally do not start before the sun went down and before it gets little bit cooler. Whenever we are going out to the centre of Haifa, all the bars and restaurants are crowded because Israelis love to go out with their friends and families, sitting outside the whole night somewhere to enjoy the cool breeze and company. What we are really enjoying is that we are so close to the sea all the time! Within a few minutes we reach the beach and can go swimming after a hot day. Finally, we really want to thank the technicians Maura and Dar who helped us improving the flow-through-systems we are working with, but also the other students from the lab, especially Martina, Susi and Erez who always have an open ear, who answer our questions and who help us with sampling the huge amounts of algae and snails we need. And a big thanks goes to the head of the lab, Gil, for all the help during our stay! It’s fun to work with you guys! The team of Gil Rilov’s lab being happy after the shark snorkeling. Laura is measuring and writing down the weights of the algae we need for our experiments. Lisa is checking the quality of the water, like the pH, temperature, salinity and oxygen. 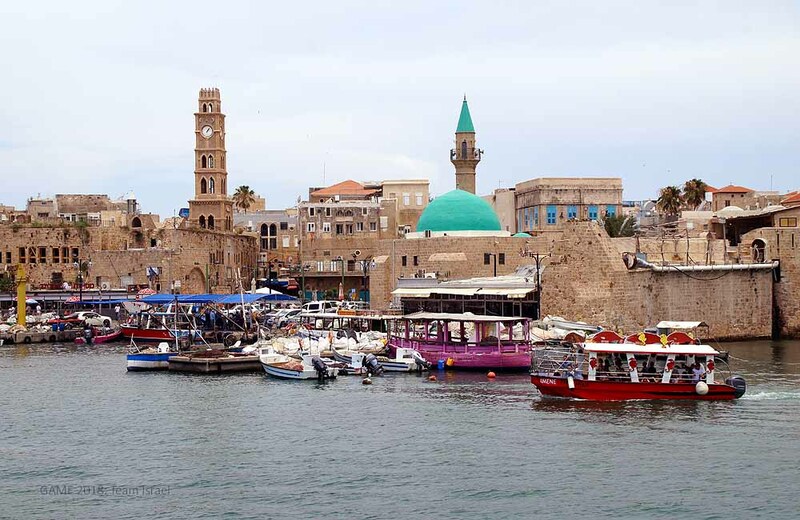 The beautiful old town of Akko, located not far away in the north of Haifa. 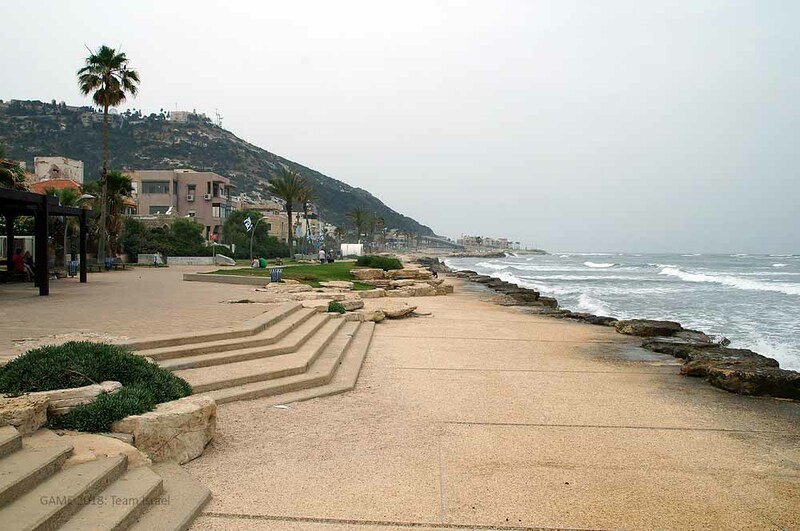 The promenade of Bat Galim.